The 80’s was undoubtedly THE decade of the Toy Franchise. Starting with the one-two punch in 1982 of Hasbro’s G.I. 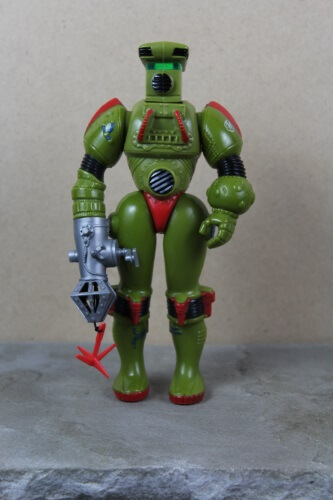 Joe – A Real American Hero line and Mattel’s Masters of the Universe, toy manufacturers, spurred on by the wildly successful Star Wars line by Kenner, were quick to try and replicate that success. Again, leading the charge was Hasbro, who in conjunction with Marvel comics, created a comic book to coincide with their action figure line; the idea being that if Star Wars as a film was moving the Kenner line, they would use some sort of visual communication medium to promote theirs. Likewise, Mattel had joined forces with animation studio Filmation to produce the animated series “He-Man and the Masters of the Universe” which was a bold unprecedented move at the time consisting of sixty-five half-hour adventures sold directly into syndication for weekday viewing. 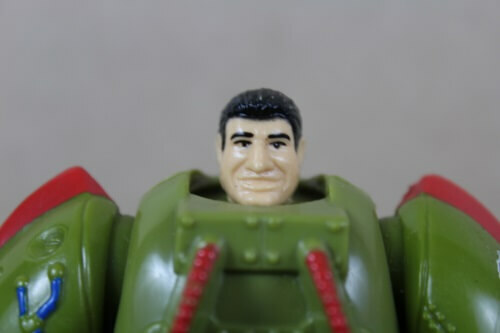 Hasbro followed suit, and experimented with two animated G.I. Joe mini-series that were a ratings-smash and lead to a third mini-series that connected to their own syndicated weekday show. Hasbro struck gold again with another innovative toy-line. In 1984, they acquired the molds and likenesses of Takara’s Microman and Diaclone line of robots, and, working again with Marvel comics, fleshed-out and created the Transformers. The rest, as they say, is history. However, none of these are the lines I’m… unearthing. In 1986, Hasbro took a decidedly different route for a new line of action figure toys. It was the height of 80’s horror movies – Jason Voorhees, Michael Meyers and Freddy Kruger were being enjoyed by fans, despite being twisted, horrific icons. Blood and guts and outrageous monsters were everywhere to be found. The Comic Book Code, a self-imposed censoring measure from the 50’s, had been relaxed for well over a decade and monsters were being featured prominently in their pages once again. Monster toys where nothing new – kids LOVED monsters. Universal Studios had dominated the market for years with toys based off their licensing, and even modern icons like the afore-mentioned Freddy Kruger had received a doll in his likeness (much to the ire of parents nationwide). 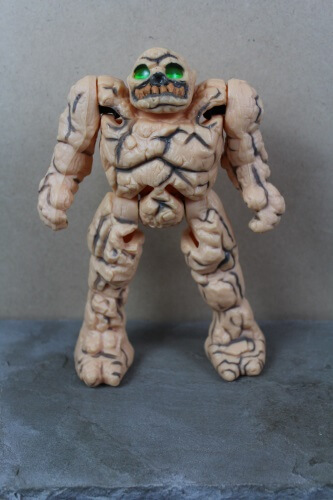 Hasbro used both strategies of comics and animation and created one of the most unique lines of creature-feature action figures that remains popular to this day – INHUMANOIDS! With a brow-raising subtitle – “The Evil That Lies Within…” Inhumanoids right off the bat let us know in no uncertain terms that it was the antagonists who were the central focus of the line. The concept was a theoretical question of “What if H.P. Lovecraft had written Marvel comics?” Three ancient monsters (that would later be expanded to five and even more so had the series and line endured) of unspeakable power and evil from within the various layers of the Earth are, one-by-one, released by diabolical tycoon Blackthorne Shore, who as an archaeology student, stumbled onto ancient texts and documents that spoke of their existence. At the same time, we have our heroes of the line, the Earth Corps. – a rag-tag team of Geologists and Spelunkers who use high-tech, cutting edge exoskeletal exploration suits to descend into the cave systems of Northern California on subterranean exploration missions. With the release of the Inhumanoids, they find themselves caught-up fighting the newly-unleashed monstrosities. Hasbro and Sunbow had created an anthology series called Super Sunday (Super Saturday in some regions) which would showcase new series in seven and a half-minute chapters, with the more popular segments graduating into full series. These shows were a way to capitalize on in-house properties and drum-up sales on the toy-lines they were based on. While these could easily be dismissed as nothing more than thirty-minute commercials for the product-featured, thanks to the skill of the writing staff at Sunbow and some great concept design work on Hasbro’s part, these shows still hold up today and most have never left the pop culture realm. So what about the toys? It wasn’t until well-into adulthood that I now, in my mid-thirties, was able to acquire some of them. 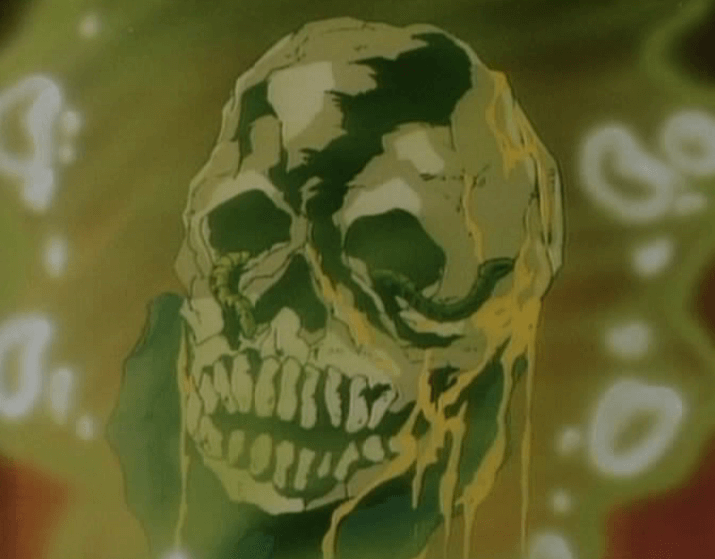 Part of the reason was, frankly, the cartoon gave me nightmares when it aired; my eight year-old mind couldn’t handle undead villains and monsters being ripped apart wholesale. My brother, who loved blood, guts and monsters, ate it up with a spoon and I often found myself watching from behind a chair, quickly occupying myself with Legos if D’Compose appeared, because I knew his presence meant one of the Earth Corps. was getting turned into a fifty-foot skeletal zombie! …with Blackthorne keeping his word to return for him, draining the swamp to have D’Compose revive his remains! As I write this article, I have the cartoon playing in the background and I really still can’t believe it aired in a prime, 10:00 AM slot. The other reason, and this is most likely the one shared among most parents of the time is that the toys are just big. Big, heavy and, to them, ugly. Most parents weren’t willing to shell out fifty-bucks-a-pop for one of the three big Inhumanoid monsters, let alone dropping twenty-dollars for the smaller Mutores, who even though were allies and on the side of good, were just as hideous in appearance. They were toys that would stick out unless you put them in the toy chest, and there was no chance they’d fit, so they collected dust on shelves before being liquidated. Even then, they still didn’t move. The toy-line was, as Flint Dille, writer and producer of the series said, a bomb. The cartoon itself was cancelled before the toys had even hit shelves. So starting off, the first figure I was able to score was a Mint-On-Card Herc Armstrong, leader of the heroic Earth Corps., so this is likely to be the best starting point. 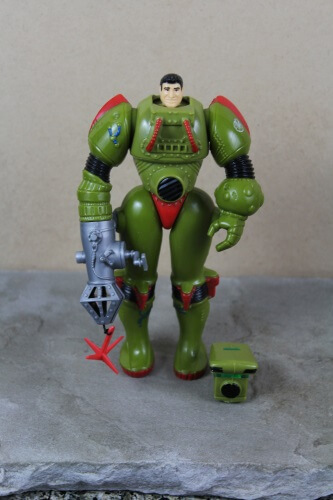 Herc Armstrong is the leader of the group of intrepid, high-tech geologists called “Earth Corps.” whose job it is to explore the subterranean depths, and as a result, wind up protecting humanity from the Inhumanoids. His specialty is geology and spelunking. Herc stands at six-inches tall and I can tell you right now, this guy is heavy! They used a thick, high-quality plastic that more resembles a hard vinyl. They were crafted quite well mold-wise and really have held up over the years. Most used samples I see have only paint-wear and decal-peeling. The sculpt is good but extremely simple. Herc, like the other Earth Corps., sports a whopping five-points of articulation. His legs are jointed at the hips, limiting him to a sitting or standing position. His arms are jointed at the shoulders and feature rotation limited to up or down. I know that as a kid when my brother and I saw these guys on the pegs, we both mocked the laughably small heads of the figures, but had we read the back of the card packaging I’d have seen that there was a reason for that – the suits were meant to make them physically larger, like an exoskeleton. The file card indicates that while wearing their exploration suits, the Earth Corps. stand nine-feet tall. Hence the small but proportionally-accurate heads. 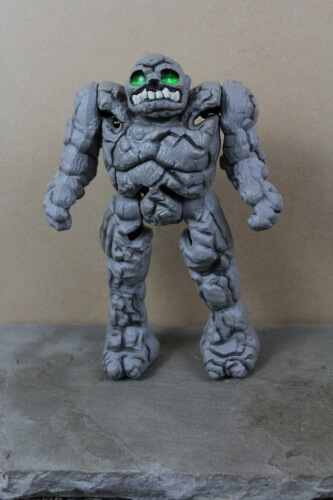 Again, the sculpt is simple. To be honest he looks more like a wise guy than rugged geologist as portrayed in the cartoon. 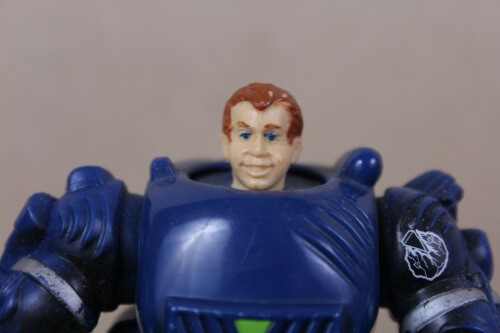 The head turns a full 360 degrees, so it can at least face the direction of play. Each figure featured two play-features (re: gimmicks) common among all. 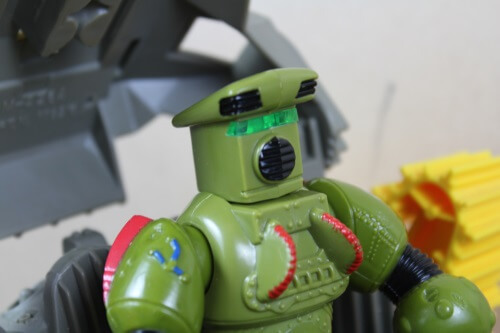 The first was all their helmets featured light-piping in which a translucent green plastic was molded into the visors that would appear to glow when placed under direct light, hence the term “Glow in the Light” advertised heavily on ALL of the toys. Next up is Dr. Derek Bright – Earth Corps. resident mining engineer. It’s stated in the series that Derek designed the Earth Corps. suits and vehicles hand-in-hand with Auger who mechanically-built them, despite the two sharing less-than-friendly rivalry with one another. Also, in the cartoon, Bright was voiced by WKRP In Cincinnati’s own Less Nessman, Richard Sanders. Bright was often the scientist studying and analyzing anything dug-up by Earth Corps. 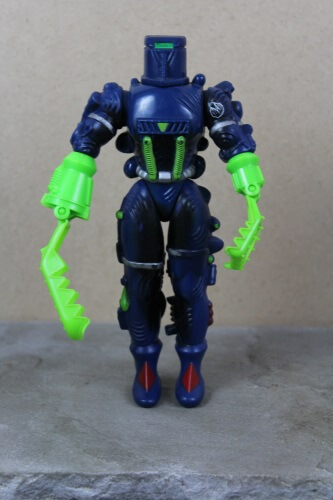 As above, Bright features the same limited articulation. His head rotates 360 degrees and I found his sculpt a bit more detailed than Herc’s, albeit a bit whimsical in expression. His specialty was digging and at one point he had the nickname “Digger” and his arms end in two large, bear-trap-like claws that were handy for excavation and climbing the subterranean labyrinths. Obviously, the Earth Corps. couldn’t patrol the depths on foot, so luckily they had two vehicles, with one aptly named the Terrascout. The Terrascout is about a foot in length and fits two Earth Corps. 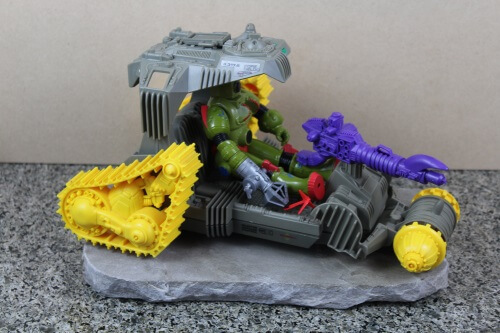 figures, one piloting and one riding on the back. The roof or hood of the vehicle is hinged, allowing access to the cockpit, such-as-it-were, and is removable. Like the helmets, it features light-piping on the form of a “Glow in the Light” sensor. In the cartoon, the top portion detached and became a hovercraft, however, sadly this is not a part of the product in-hand. 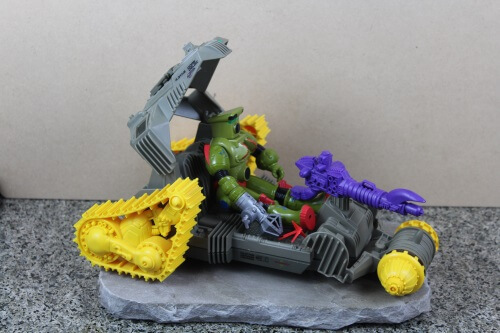 It features a rotating, rock-eating auger-drill in the front and faux-tank treads that have imbedded wheels underneath and the plastic is again, quite thick. However, it feels much more brittle than that of the figures and has the earmarks of being a true-plastic. In the front there is a laser-cannon that pivots 360 degrees to “ward off Inhumanoid attacks,” but I have yet to be able to have a character with enough reach to grip it. It was molded in its primary colors of yellow, Purple and dark gray and features some decals that have held-on quite well over the past twenty-nine years, remaining flat and taught to the plastic’s surface. Of all of the toys in this line, I can see the vehicles being the one that most likely sustained damage during play and over the years of constant shuffling around. In their fight against the Inhumanoids, the Earth Corps. made allies with benevolent, smaller monsters known as Mutores. They were, basically the tree-people and rock-people in the forms of the Redwoods and the Granites. The Redwoods were surface dwellers, residing in the Big Sur National Forest while the Granites lived deep in the lower crust and mantle. First up is Redlen – leader of the Redwoods. 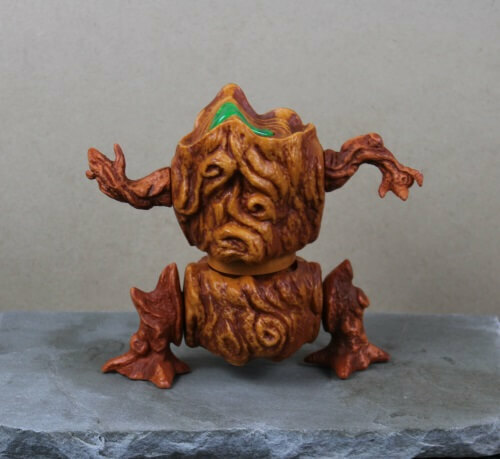 In the cartoon, the Redwoods were an ancient and wise race who would shrink to resemble gnarled tree stumps and when either greeting an enemy or a friend would suddenly “grow” into their true height and quasi-humanoid form. Redlen stands six-inches high in his “disguise” and swivels 360 degrees at his waist, which is collapsible and extends upwards to make the figure ten-inches at full-height. The likeness between this and his cartoon counterpart is, to say, lacking. In addition to his waist, his arms and legs swivel a full 360 degrees, giving him the same limited articulation as the other figures. All the Mutores and Inhumanoids had the light-piping and Redlen is no exception. 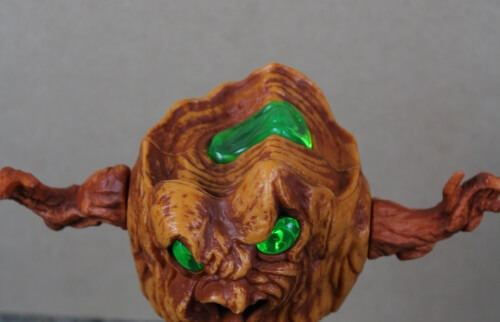 The one really cool aspect of the figure is that its eyes truly do look “alive” when light moves through the green plastic, giving it an eerie quality. The paint apps are simple and have held up extremely well; most used samples of these guys look new for the most part. 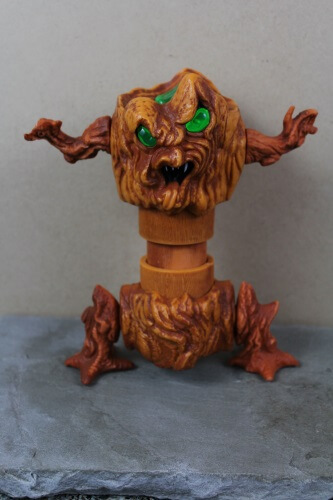 There were two other Redwoods released; a lighter, more yellow version known as Redsun, who was the go-between for the Redwoods and the Earth Corps. and a dark, ashen-gray that was representative of the Redwoods whole as a race. The Granites are rock people, as mentioned, who lived deep in the Earth and were master builders. At one point a plot point is mentioned that the Mohorovičić discontinuity (the natural boundary between the crust and the mantle) is one enormous wall-fortress built by the Granites. 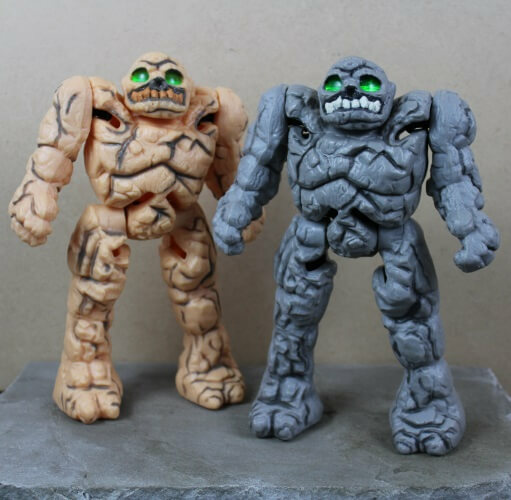 Grannock – the leader (above) and his token member of the Granite race (below), stand about eight-inches tall. The articulation is weird, as the arms and legs are attached by bands inside and move about in slots. Like the Redwoods, they could conceal themselves in their environment by appearing to become a pile of ordinary-looking rocks. If this feature works, I have yet to see it in action myself. Their arms and legs dangle loosely when held, but they stand well-enough without any support. The arms and legs constitute a full 360 degree range along with the head. Like Redlen, they have “Glow in the Light” eyes and again, the effect is cool and works. I have them in a display cabinet with overhead lighting and in the dark they display exceptionally well when the light comes through the above glass, giving them a real “subterranean monster” vibe. I guess in looking at these toys and breaking it down, while they look and display impressively, as an actual toy there’s very little they did and perhaps I’m in agreement that the toys were indeed bombs. They resembled what was in the cartoon (mostly) and I guess that in itself is satisfactory to an undemanding eight-year-old. 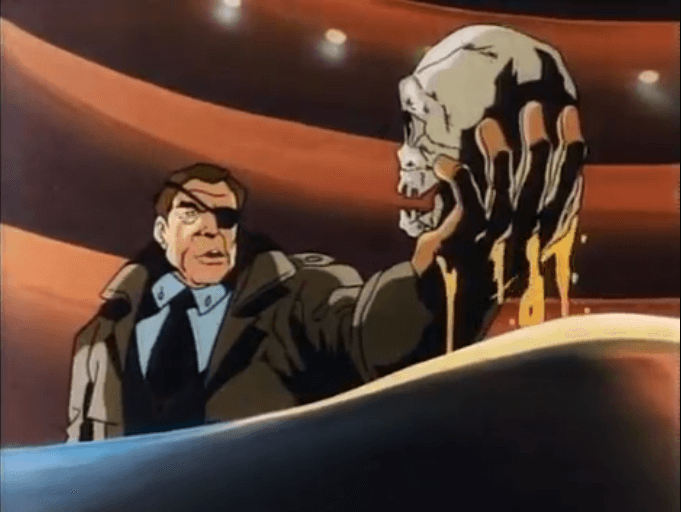 However the show was written for a much older audience and had some sophisticated jokes and puns that I know went over my head at the time of airing, coupled with some classic 80’s gore and horror. It’s easy to see why the line failed at the time and now appeals towards the adult collectors and monster-fans. 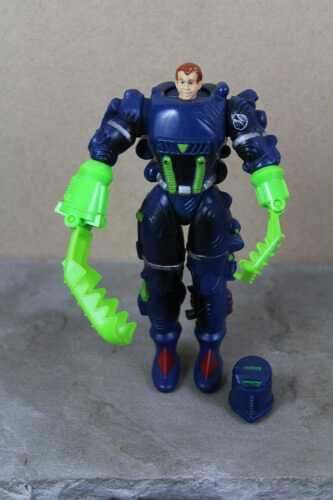 I’d love to see what Hasbro would do with a monster-themed action-adventure property in today’s toy market, especially with all the advances in tooling and such. 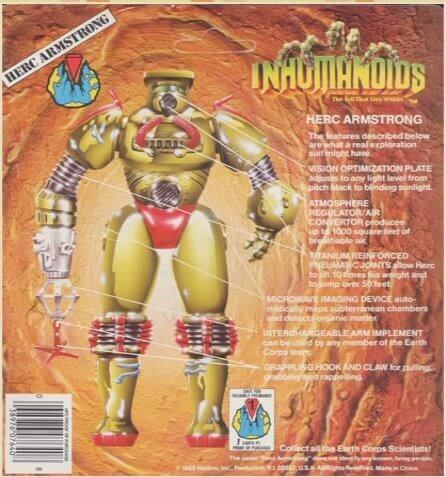 Maybe we can get Hasbro to “unearth” the Inhumanoids. 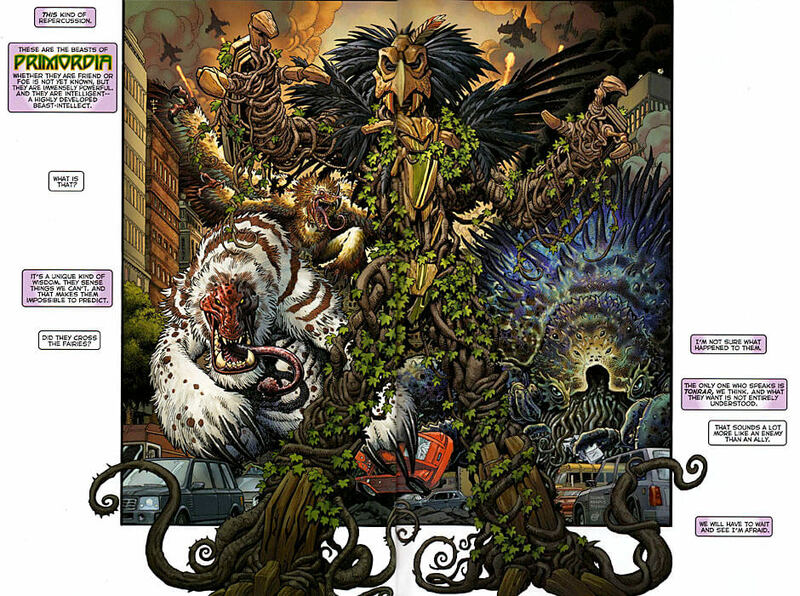 The line was featured in the Hasbro UNIT-E comic that showcased all the potential toys we could be seeing from Hasbro and featured a splash-page of art by monster-artist extraordinaire, Arthur Adams.